Fireball is a contest this week. Review will be up after the contest deadline closes. Note: The one-word Across clues all have an unusual relationship with their answers. Okay… [checks clues]… All the Across clues are one word. Cool. 1a, CARE [Mined]. Mined is a homophone of mind, which means CARE. 13a, A TAD [Sum]. Some. Once I realized that the Across clues would require mental gymnastics, I switched to solving Downs only. Because the theme is so strange, the Down clues had to be easier than usual for Thursday, so I was able to solve almost the entire puzzle without looking at a theme that comprised fully half of the puzzle. I don’t know which I dislike more: the fact that it was so easy to disengage from the theme, or that I wanted to immediately. A big danger with homophone themes is that some homophones hold true for some dialects of American English but not others. For example, [Clothes] (cluing SEAL) isn’t a homophone of “close” the way I say them. Other possible clues in this puzzle that might not be homophones for all solvers include whit/wit and handsome/hansom. Alex was mostly able to avoid this, which is impressive given the sheer number of theme clues in the puzzle. Some of the clues, even after translation, didn’t quite work for me. PEONY, for example, should be clued as [Type of flower] rather than [Flower]; similarly, RYES should be, say, [Some liquors] rather than [Liquors]. This is a textbook stunt puzzle: it came to be because the constructor asked “Is this feat of construction even possible to execute?” rather than “Will this be fun for people to solve?”. Evaluating the puzzle on its own terms–which is to say, how well the stunt has been executed–I think it’s a huge success. Making a 78-word puzzle where every across answer can be clued with a single homophonic word is no small task. As to the second question, I think the aha moment will be very satisfying to a lot of solvers, but I also think the aha moment may come so early in the puzzle that the rest of the solve becomes a bit of a slog. Finally, I’d love to hear from someone who wants to defend the entry BISTRE. 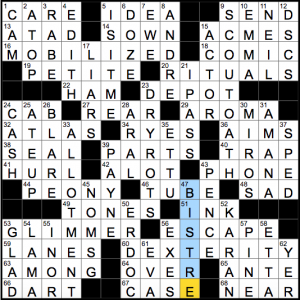 The fill in this one was largely very clean (as you’d expect in a 78-word/42-block puzzle), but I’ve never seen BISTRE in the NYT before, and it stuck out like a sore thumb. Have you seen BISTRE in your day-to-day life, and if so, where? Tidy little theme where words ending in CON are “fused” with other words beginning with CON. 27a [Result of throwing a dictionary into a wood chipper?] LEXICONFETTI. Sounds like the makings of a great party for cruciverbalists. 58a [Target of many an Oscar Mayer ad?] BACONSUMER. Sure, they make bacon, but I think they’re usually associated with wieners. It would have been nice if there was some sort of connection between the first and second words of each entry to add a level of constraint, perhaps with deacon and congregation or falcon and condor for example. Or maybe [Result of overcooked rashers]: BACONFLAGRATION. As is usually the case, the fill is strong with this one. I liked AUDIOTAPE, HONOR CODE, ESTONIAN, SALTINES, and DECEMBER. Also good: CRINGE, SYNTAX, KIMONO, and especially OPTICS (clued modernly as [Public perception of an event, politically]). Also of interest is 51a ARC LAMPS [First practical electric lights]. Precursor to the incandescent bulb, the arc lamp was invented in 1800 and became widely used for street lighting in the 1870s. The light itself comes from a spark (an electric arc) between two carbon rods. For more information than you’ll probably want to know, check out the Edison Tech Center website. 25d KIMONO. [Garment whose name means “wear-thing”]. I always like learning the meanings of common foreign words. 38d DECEMBER. [Last page, sometimes]. Was not thinking calendars, so this entry gave me a little a-ha moment. Overall, though the theme is simple in this puzzle, it’s executed well, and the outstanding fill tops it off. 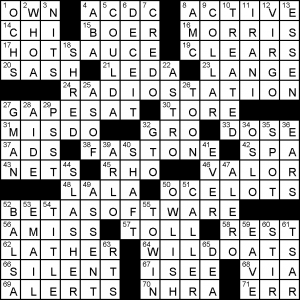 “Double Trouble”: each theme entry has a type of trouble (WOE, STRESS, PAIN) where the down clue doubles the letter in each square (using WOE as an example, TWO EXTREMES only uses one each of W, O, and E, but BOWWOW, OTOOLE, and EELER each need two.) Voila. I’ve got a busy afternoon at work and the rest of the fill was pretty straightforward, so I’ll leave things here. I thought this had a good concept and was executed well. 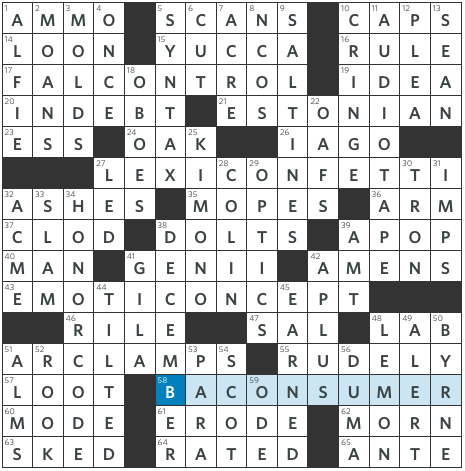 When making a puzzle with a well-worn theme concept you’re probably looking for two things to make your puzzle stand out: an interesting, and novel revealing answer; and lively, “themeless grade” theme answers. WILDOATS borrows the cryptic trope of using “wild” to signal rearrangement, in this case of the letters in OATS. OATS anagrams to TAOS (New Mexico), OAST, and STOA, which doesn’t lead one far as far as puzzles go. Plan B here is the more open “span across two words” trick, executed here. H(OTSA)UCE puts fire in your belly, especially as an ingredient as a rather masochistic shot that usually includes overproof rum or some such; RADI(OSTA)TION is a rather bland answer, as is its partner BE(TASO)FTWARE – I think that’s partly because they are long forms of answers that are typically abbreviated. The set is completed by a central F(ASTO)NE. The grid is functional, as is expected with five horizontal entries. Pannonica would be itching to tell us that OCELOTS not only are [Leopardlike…] but both scientific (Leopardus pardalis) and common names mean leopard… Its cousins include the margay and the kodkod, the last of which is IMO the cutest of the genus. What else? Um. Um. [Elephant flappers] would make a singularly unkind nickname, though an unlikely one for a kodkod. This entry was posted in Daily Puzzles and tagged Alex Eaton-Salners, Brendan Emmett Quigley, Ethan Erickson, J. Michael McHugh, Mike Shenk. Bookmark the permalink. Sensed the gimmick after the second clue and the third confirmed it. Agree with Andy about the fun factor but the idea is such a good one the puzzle has to rate 5 stars. I wish I hadn’t seen the notes before solving this – it made the trick immediately obvious, instead of giving me any head scratching. Clever, yes but not fun. A slog with little payoff. An accurate review by Andy from my perspective. While getting the trick quickly I tended to try figuring out the homophone and only resorted to the Downs when I came up blank. BISTRE: a thin wash made from soot of various woods used in drawings… See examples from Rembrandt et al via google. Have to agree with the review regarding the fun factor on this one. It was non-existent. I mostly liked it, and in some cases it was entertaining to figure out which of the possible homophone meanings was intended. Didn’t care for ATLAS, RYES, and PEONY because they are all “type of” clues, and for me too clothes/close are not homophones. BISTRE was definitely an outlier. But overall I thought this was a nice and somewhat different Thursday puzzle. I’m in the “loved it” category; clearly a controversial puzzle. Sure, could’ve ignored the Acrosses but it was much more fun to guess at the right homophone than to deal with the conventional Down clues. Like a bit of a cryptic / standard crossword mashup. BISTRE is terrible, more so in this puzzle since the crossings were all homophones. And the note was unneeded and detracted from the fun — got the gimmick in about 10 seconds instead of taking a bit to notice that all the Acrosses were 1 word that could be homphoned. But overall this was a win for me. In re is pronounced in ray. Do re mi is do ray mi. Re standing alone is ree. But why is the fill GLIMMER? [Ray / Glimmer] of hope? Agreed on Andy’s entire commentary. Special No to Bistre! That said for a one-off like this, I suppose some corners have to be cut. Theme was juvenile and quaint. Perhaps a bit beneath the sophistication expected of Thurs NYT xword. I didn’t know Bistre (did anyone? ), and looked it up after I got Sir Happy Pencil. But this IS a late-week puzzle; it is always fun to learn an interesting new word. Now to retain it beyond a week or so might be a different story, but I don’t agree with the complaints. I knew BISTRE but only as a technique for under-painting for an oil painting, or any other transparent medium. I didn’t know it’s a color. BEQ review has last week’s puzzle title in the review title. Correct title is noted in the text of the review. 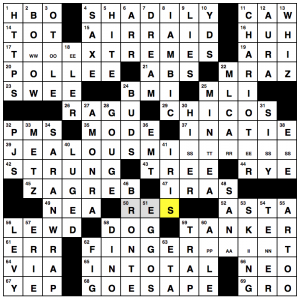 I didn’t care for the NYT puzzle. Once I got the theme, which was pretty quick, it felt like a chore to work my way through the rest. I was very close to just skipping the rest. I think the problem is I generally like clever clues and clever answers. But this one, other than the gimmick, had very little of either. Just a single word that can mean another word. Pretty boring. Agreed that it’s an impressive feat (feet? ), though.